Deborah Farquharson finds most of her inspiration in the landscape around her farm in Mulmur, Ontario, where she lives part time. She spent her childhood weekends and summers in this area and continues to think of it as home despite raising her children in Toronto. Deborah’s continued development of a more process oriented painting arises as a natural progression from her investigative photography practice. She uses acrylic and various drawing mediums on wood or paper. 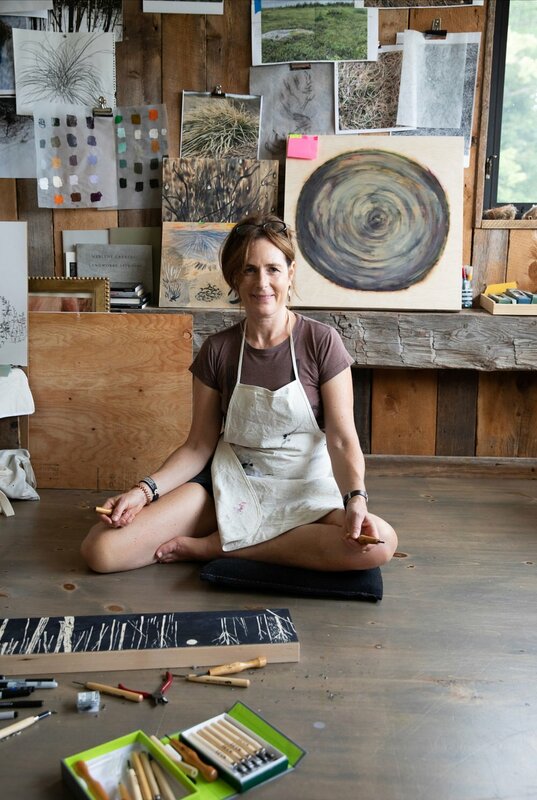 Her recent work incorporates painting with fire on wood as a way of harnessing the unexpected marks that arise from the manipulation of the intensity of flame on wood. After graduating with an Arts degree from McGill and a BFA from Ryerson University, Deborah coordinated a history of photography and production workshop in Paris through Ryerson's continuing education department. She has shown work in the Creemore Curiosity House Gallery 2018, the Peter MacKendrick Gallery, 2018 and 2017. ArteMbassy Group show, 2018 and 2016. The Creemore Arts Festival, 2015. Ben Navaee Gallery, 2014. The Riverdale Art walk, 2010. Cantine Restaurant, 2008. The Red Sable Gallery, 2007. The Ryerson Gallery, 1999. The Alliance Francaise, 1998.